I crocheted this beanie for my husband due to his official trip this month. 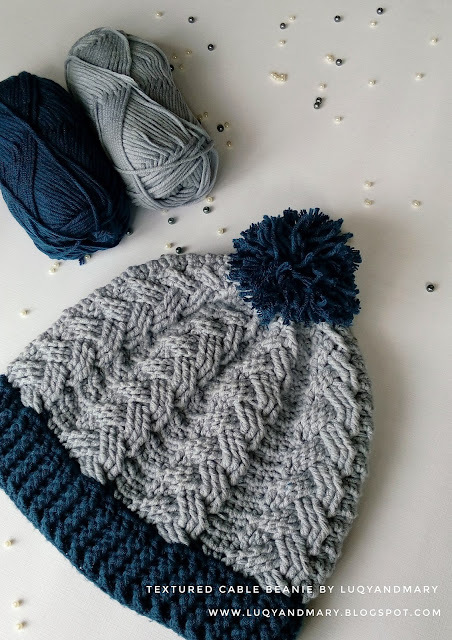 It must be chilly during the winter so I choose Cable Stitch to create a chunky textured hat. It took me almost 2 weeks to get it done before I almost gave up! I had been crocheting for almost two years but had never been deal with this Cable Stitch, so it was a really great achivement for the first time trial yeaay! 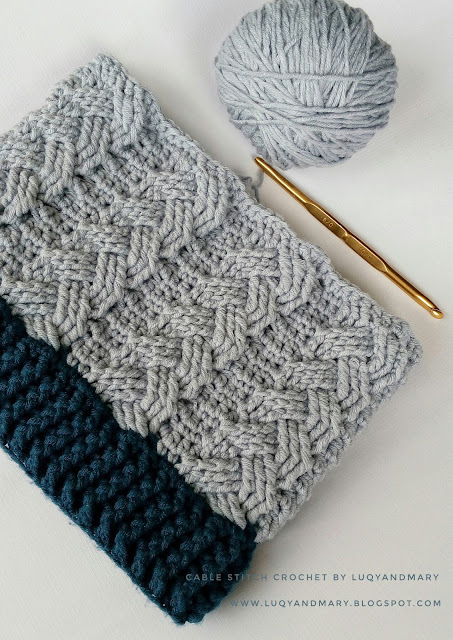 Thanks to Little Monkeys Designs channel for the very easy and clear tutorial of the Cable Stitch Crochet. I had no plan to write the pattern until I decided to post it to a crochet group where some members then asked me for pattern. The good news is here I gladly write the pattern for all of them, and the bad one is it is definitely just "written pattern" no step by step picture. Sorry for that but I will try to do my best! 1. You may sell your finished item made from this pattern but please do not re-share or claim my pattern as your own. If you would like to share please directly share the link of this post. 2. Paid pattern of somewhat similar hat is available at Inventorium Etsy Shop. This written pattern by me may has some differences in the stitches, method, as well as the final works. 1. This hat is crochet from the bottom to top. 2. Foundation chain must be multiple of 11 (9 chains for 9 cable strands, 2 chains for space between two cables). 1. Determine the head circumference. 2. Make foundation of 11 or 8 (Toddler size) chains, and it has to be as long as or close to the head circumference. One or two chains longer or shorter is acceptable. It can be adjusted by crocheting a little bit tightly or loosely / decreasing or increasing the gauge. Chain 88, SS to the initial chain, do not twist the chain. Special note: I highly recommend you to learn this VIDEO before starting this section. It will teach you very quickly to master Cable Stitch Crochet! Special note: FPDC in this row will be numbered as 1st to 9th in row from the beginning of the row. Row 10: Repeat row 8. Row 11-14: Repeat row 7-10. Row 15-18: Repeat row 7-10. I add 2 more rows (same as row 7-8) to make the beanie higher, but 18 rows is already quite enough. This is the decreasing section. We decrease 2 strands into 1 in each row. Decreasing point is underlined. Special note: I don't use any pattern or tutorial in this section but I think this VIDEO will be helpful. Row 20: Repeat row 8. Row 24: Repeat row 8. Cut off the yarn weave in ends. I hope this pattern will be useful for you to create this classic beanie! Thanks for stopping by have fun with the pattern! Do you count the chain 2 as the first double crochet? Hi tracy, CH2 in the beggining doesnt count as first DC. Is this English or American version? If I was to do a toddler size how many rows do you suggest? Hi, Im'm new to this, what does the 88 means ? I don't know how many chains I need to start with for an adult men size..
How can I convert this for a two year old? Hi tanya, u can use the pattern but change the size of the yarn and crochet. I hope I can make another size for the pattern..
Looks great! How manny yards did you end up using? For the body? Hi. What does do this backside in row 9 mean? Thank you. hi amanda,i suggest u to watch the video tutorial of cable stitch, just click on the word "VIDEO" in BODY instruction and pay attention to minute 7:10. 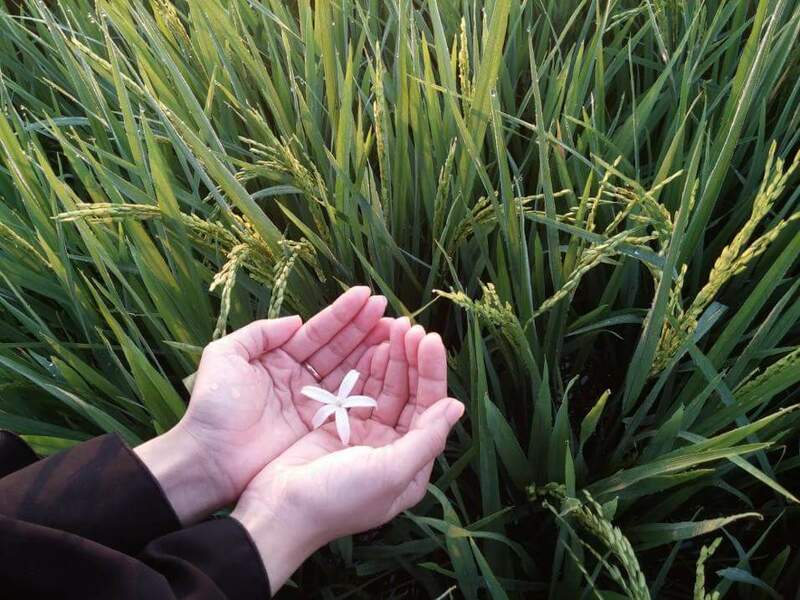 My english isnt very good so I worry that u wont understand if I explain it in sentences. It is very, very helpful to watch the video! hi Alicia thanks for stopping by. No Double and treble are different. In this pattern I used, DOUBLE, TREBLE, and DOUBLE TREBLE. DOUBLE only use in row 6. for the next row and up, I alternately use TREBLE and DOUBLE TREBLE. in DOUBLE you yarn over once, and pull the yarn twice, TREBLE you yarn over twice and pull out the yarn 3 times, but in DOUBLE TREBLE you yarn over 3 times and pull out the yarn 4 times. In row 6 we use DOUBLE TREBLE because we have to start the row from 4th-6th stitches, so we have to skip 3 previous stitches and we need longer stitch to reach the point, that's why we use DOUBLE TREBLE. In row 9, we use TREBLE because we sart the row from 1st-3rd stitches, no stitches need to be skipped so we dont need longer stitch to reach the point. Thats why we use TREBLE. Hope it helps, and I recommend you to watch the video in the BODY section. Hello!in row 11 we repeat row 7.so we do fpdtr on the hdc of row 10 or on fpdtr of row 9?thank you! is the "backside" instruction mean to use a "back post" stitch? Or does it mean to go into the front of the three stitches, but behind the previous worked stitches? I watched the video and she uses back post stitches, so I couldn't figure it out. Keep sharing such useful informations. Thanks for shearing about this I thinks its very hopeful post and very important post for us.thanks for your great and helpful presentation I like your good service.I always appreciate your post. oday there is no approved CAT-6 or CAT-7. While some folks are selling products they call Level 6 or 7, there aren't even specs for them, making CAT-5e the best available option. Hi! I'm finishing up my hat (great pattern!) and I think you miscounted some stitches toward the end. I believe there should be 56 in row 25 and continue with the decreases from there. Hi.. my name is Diyas. 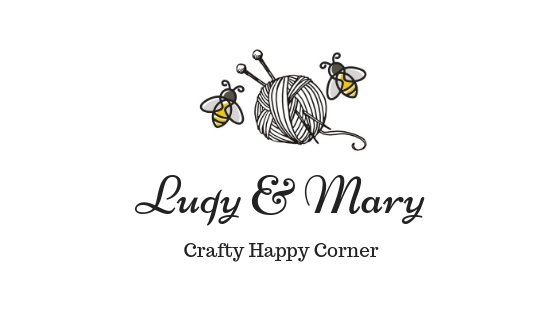 Welcome to my blog where I share my love to crochet to all of you!